Born: 11th October 1878, Woolwich, Kent. Baptised: 8th November 1878, St. Mary Magdalene, Woolwich, Kent. Parents – Nina Eliza Swinnerton Blandy & William Poyntz Blandy, a Lieutenant – Royal Artillery. Died: 24th April 1917; age 38; Died of Wounds – No. 20 General Hospital. Residence: The Royal Societies Club, St. James Street, Middlesex. Date of Entry Therein: 10th November 1914. 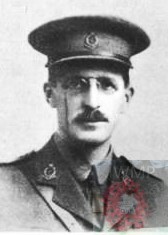 On the 14th August 1914, Gurth took a temporary commission as Lieutenant in the R.A.M.C. at the outset of the war. London Gazetted – 13th July 1916 – Temporary Captain. He was promoted to Captain on completion of a years service. Regiment: Royal Army Medical Corps, attached 29th Division, Royal Engineers. Served in the South African Campaign – Queen’s South Africa Medal of 1901. The Arras Offensive & associated actions. Medals Awarded: Victory, British War & 1914 Star + Military Cross – 3rd June 1916. Relatives Notified & Address: Son of Col. W.P. & Nina Eliza Swinnerton Blandy, of Alvescot, 74, Corder Road, Ipswich. Brother to GERALD CASTLETON BLANDY. 1881 2, Nelson Terrace, Hampton road, Twickenham, Middlesex. Gurth was 2 years old and living with his siblings at the home of his maternal grandmother. Elizabeth Martha Dyer (nee White), 51, a Gentlewoman, born Silk Willoughby, Lincolnshire. Stephen Poyntz Blandy, 7, born Belgaum, Bombay, India. Nina Margaret Blandy, 5, born Woolwich, Kent. 1891 ‘Altadore’, Church Road, King’s Norton, Winchestershire. Gurth was 12 years old, he was a visitor to 47 year old, Francis William Underhill, a Surgeon & his family + nephew. 1901 17, St. John’s Park, Upper Holloway, Islington, London. Gurth was 22 years old, a Student of Medicine He was living with his widowed maternal grandmother. 1911 Middlesex County Asylum, Napsbury, St. Albans, St. Peter’s, Hertfordshire. Gurth was 32 years old, a 2nd Assistant Medical Officer. Gurth’s father was William Poyntz Blandy, born 1846, High Wycombe, Buckinghamshire – died January 1921, ‘Inglewood’, Belgrave Road, Torquay, Devon, late of ‘Alvescot’, 74, Corder Road, Ipswich. Gurth’s mother was Nina Elizabeth Swinnerton Dyer born 1853, Grouville, Jersey, Channel Islands – died 1896, Eccleshall Bierlow, Sheffield, Yorkshire. Gurth attended Sheffield Royal Grammar School. Edinburgh University – Student of Medicine, 1895-1902; M.B., Ch.B. 1902; M.D. 1912. University of London Undergraduates, 1901. After filling the posts of House Physician at the Norfolk & Norwich Hospital, as Senior House Surgeon, at the Scarborough Hospital & Dispensary. Followed by Assistant Medical Officer at the Norfolk County Asylum, Thorpe. Gurth joined the Middlesex County Asylum, Napsbury, Hertfordshire, as Assistant Medical Officer.